I didn’t come close to snagging anything hit, but I got a toss up from Luis Avilan to get me on the board. During the game though, I did get Jason Heyward to toss me the 3rd out ball to end the 2nd inning when Eric Campbell flied out. So there’s that. 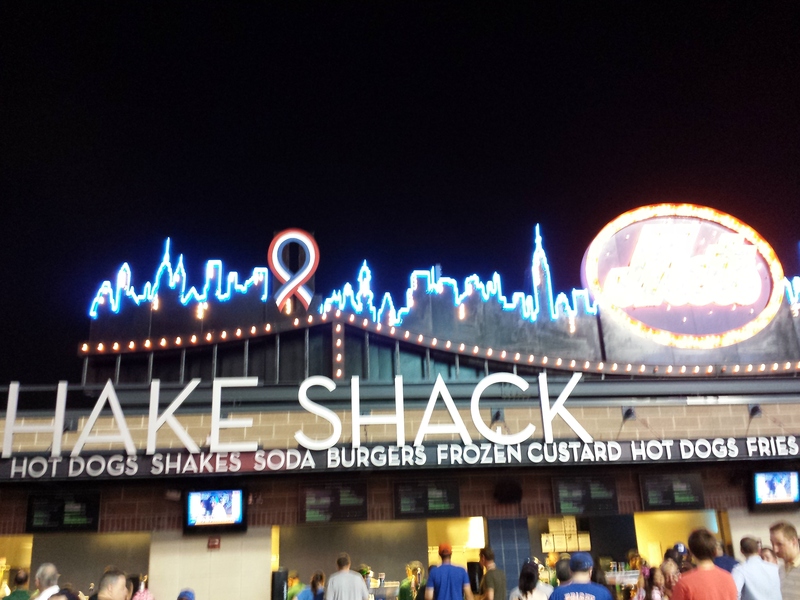 Pretty basic night at Citi. I took the 7 back to Grand Central, and took the long ride back home, and got back very, very late. These posts get better, I swear. Sometimes I think I have bad luck. 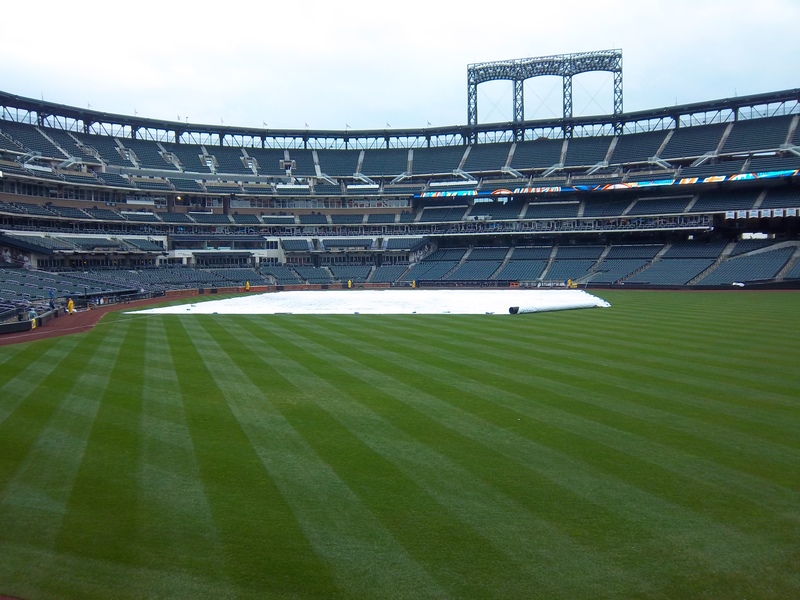 Everytime I buy a season ticket for a Mets weekend game, it either rains or there is no BP. The point of a season ticket is so you can enter a half hour before everyone else does. 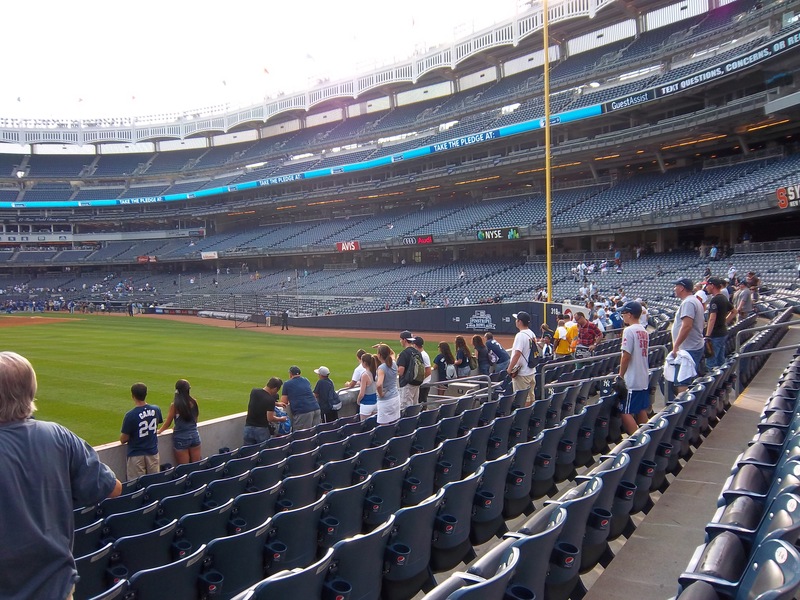 Usually this means having an entire stadium essentially to yourself. Gate times were opening at 4:40. I met Greg at the gate, and at 4:35, it started raining. What happened next is exactly why I hate New York stadiums and security. Look at the picture before my angry selfie. See all the people? 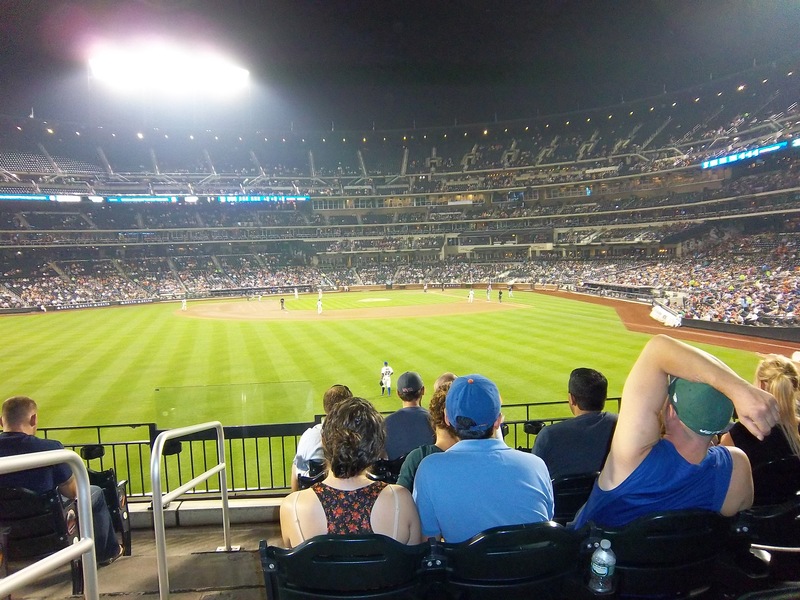 Well, the usher in my section decided I wasn’t allowed to stand there – I was the only person in the stadium – I was literally standing there looking at my phone – and he had probably the crappiest attitude I’ve ever seen someone have. 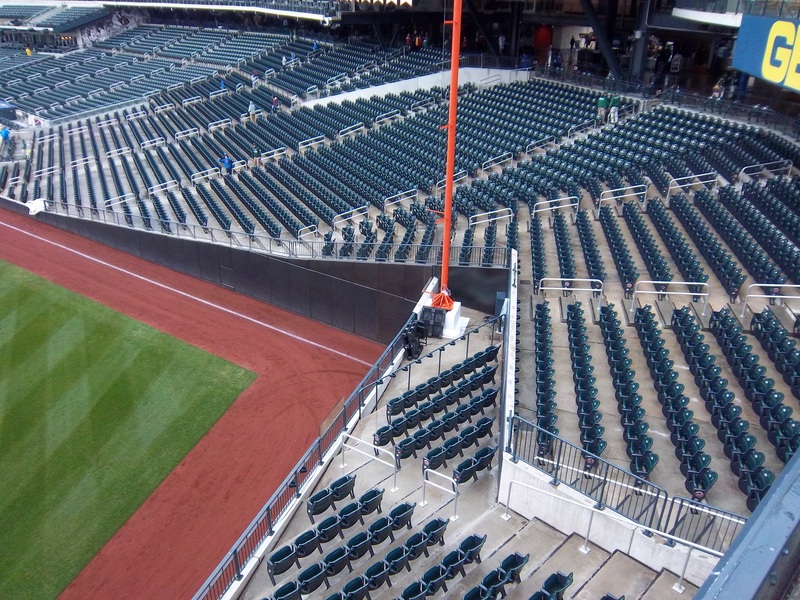 See the open space next to the foul pole? Someone else had the same idea as I did, and while I was up taking pictures in the second deck, he found the only easter egg sitting there. 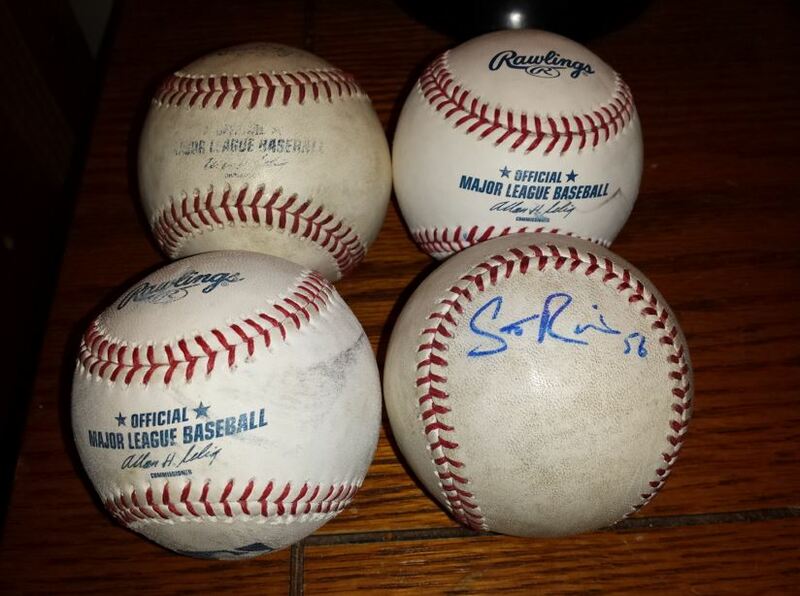 Stanton hooked me up for ball 1 of the night. 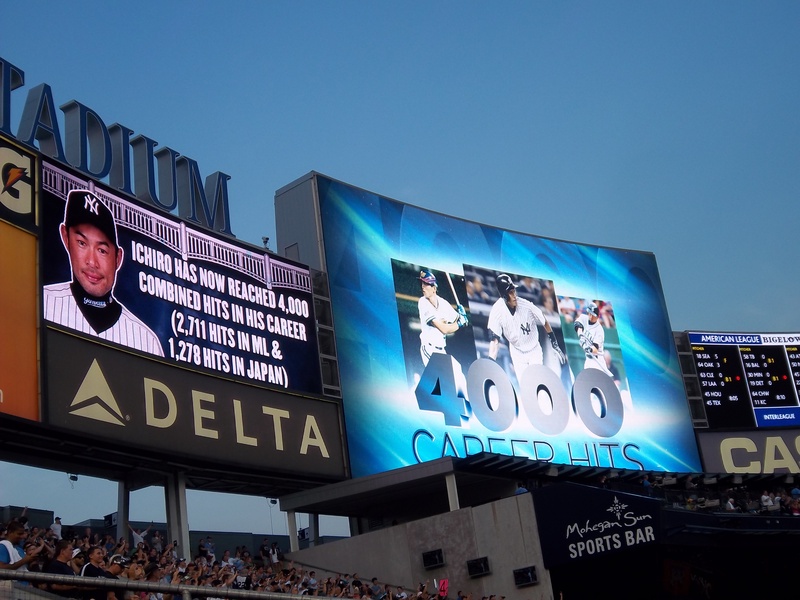 That felt pretty cool, because I love Stanton. Though, it’d be cooler to catch a BP homer of his. So I didn’t have much competition. 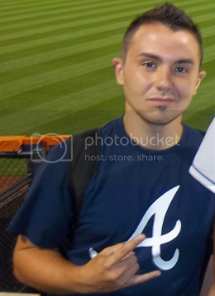 When Travis d’Arnaud flied out to end the 3rd inning, Yelich tossed me the ball for my 2nd and last ball of the night. This game was fun for a few reasons. First, this was the 1st time I’d ever seen the St. Louis Cardinals at a ball game ever. 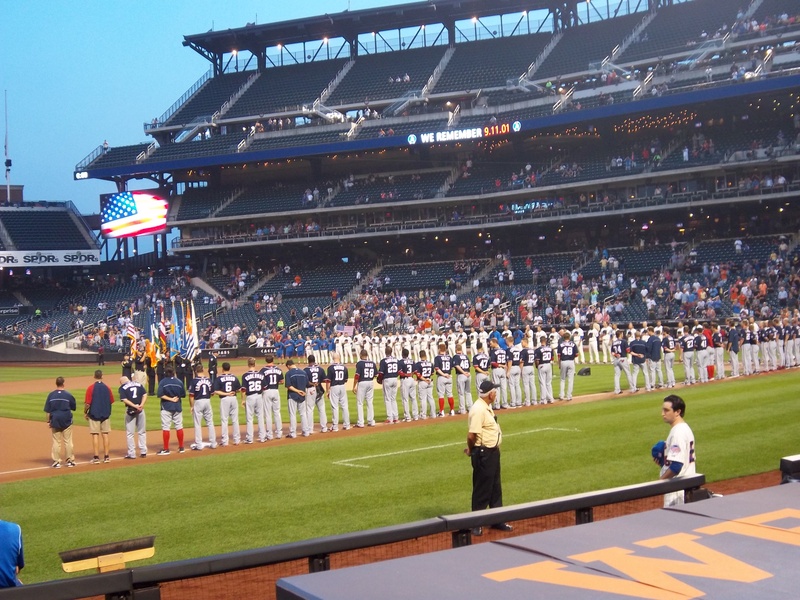 I had now seen every team play live, which was kinda cool. Also, I skipped my grad class at night (shh) and went to the game. I’d had enough. After he did his drill players do where they throw the ball at the wall and field it, I asked him for the ball in Japanese and it actually worked! That was the first time I tried it and it worked, so that was very fun. Now, plenty of ballhawks have told me that the Cardinals aren’t the friendliest of teams. I try to give everyone a fair shot, but man, these guys are just rude sometimes. 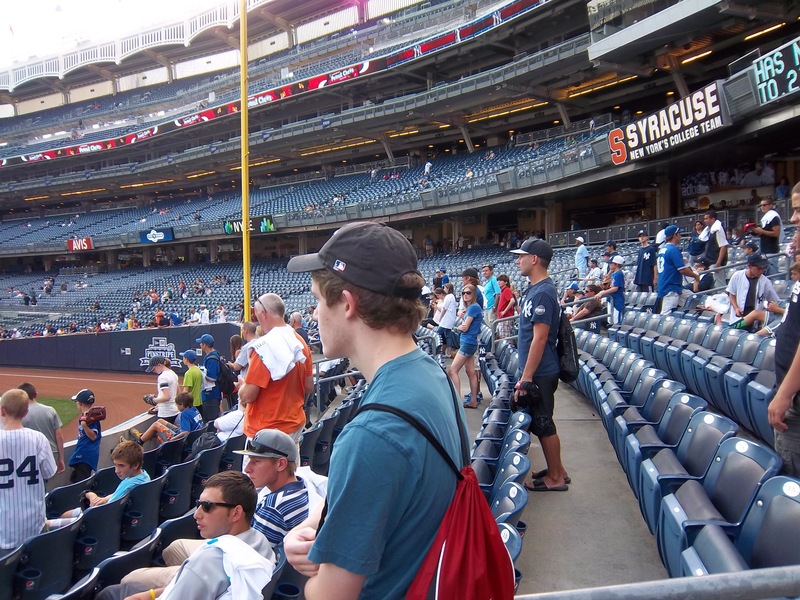 I had Cardinals gear on, and I got pretty much ignored. Even the kids. I wonder if there is a rule they have in place or something. I get that they don’t HAVE to give anything away, but still. C’mon. 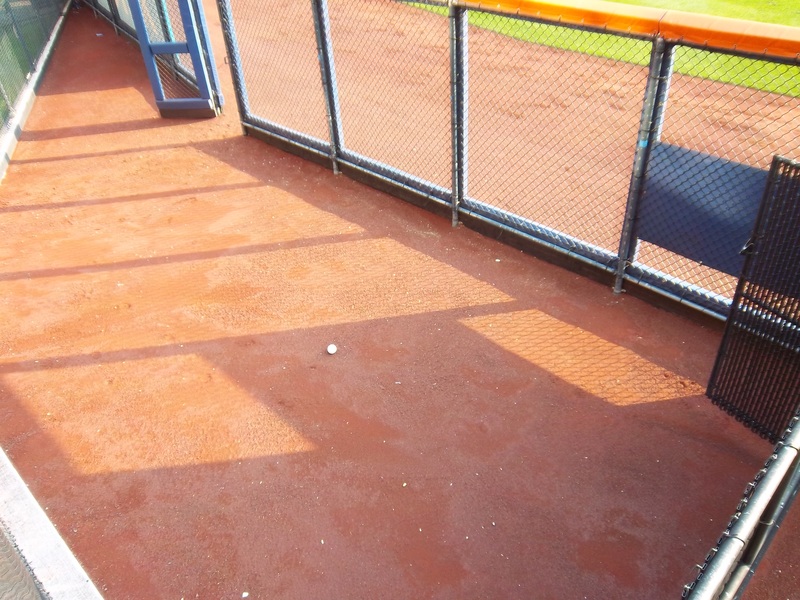 One example in particular – I was standing along the left field foul line when a little girl asked Trevor Rosenthal for his ball. He looked at the ball, and proceeded to launch it across center field into the black batter’s eye. I’d never seen that before. Look at the photo above if you need a reference. 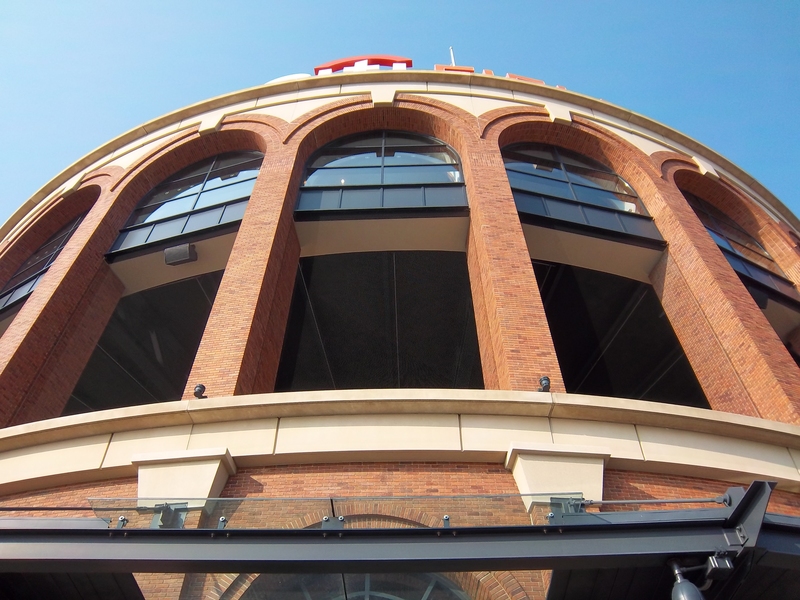 I do remember that a St. Louis player hit a home run into the area between the original outfield wall and the wall that the Mets moved in a few years ago, and I got a security guard to toss me that one for my 3rd of the day. 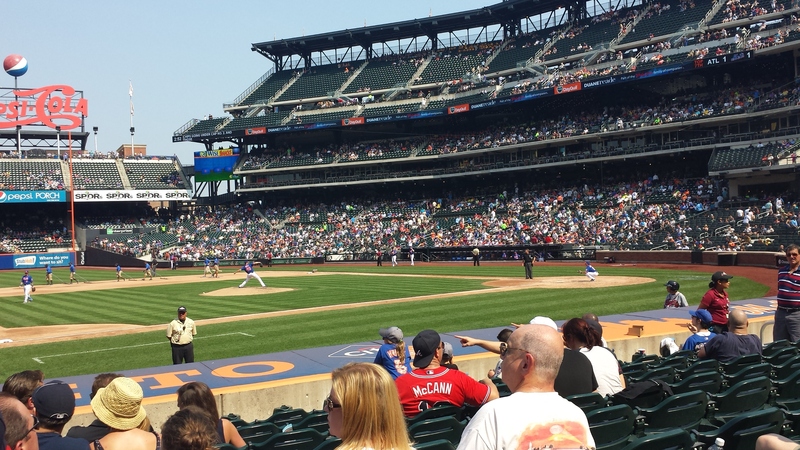 My seats were pretty good, and the Mets were wearing camo uniforms for the game, but otherwise not much more action here. Today was possibly the worst ballhawking day possible. A few days prior, I had bought the tickets because it was my only day off from work. What I neglected to do was check the weather. 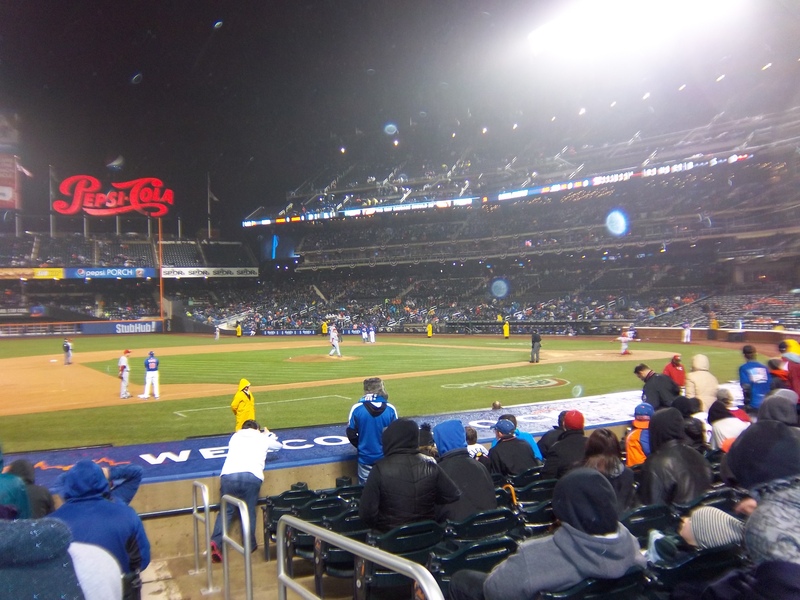 The forecast for the game was rainy with temperatures barely exceeding 40 degrees. With wind. I’m an idiot. I brought my friend James with me to the game, and it was his 1st ever MLB game. I don’t think I could have brought him on a worse evening. 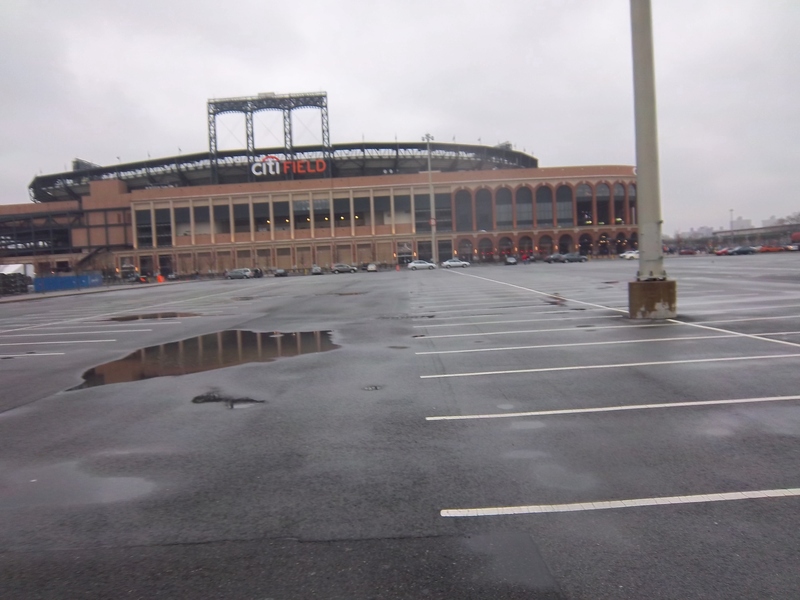 Here was the busy and exciting scene outside of Citi when I arrived shortly after 4:30 p.m.: Fun! 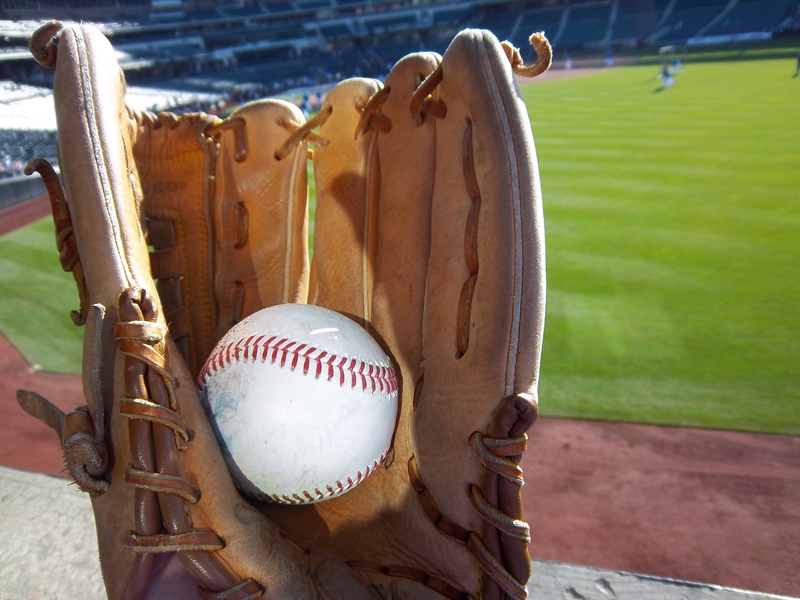 B) threw it behind to foul territory. So that was that for the pre-game toss. Still off the board. 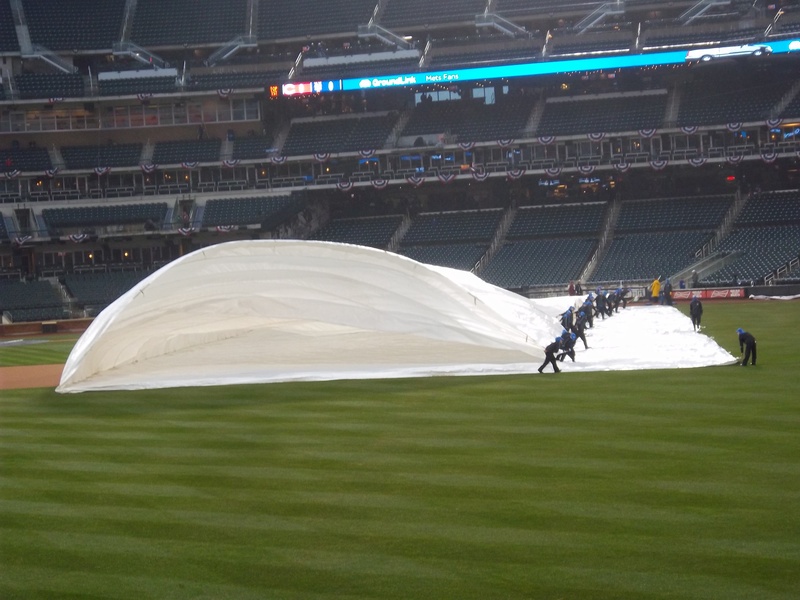 Eventually, the tarp came off: I was situated out by the Mets bullpen. I was literally the only person there besides James (who left to get fried dough), and some other kid who was wearing a black jacket. 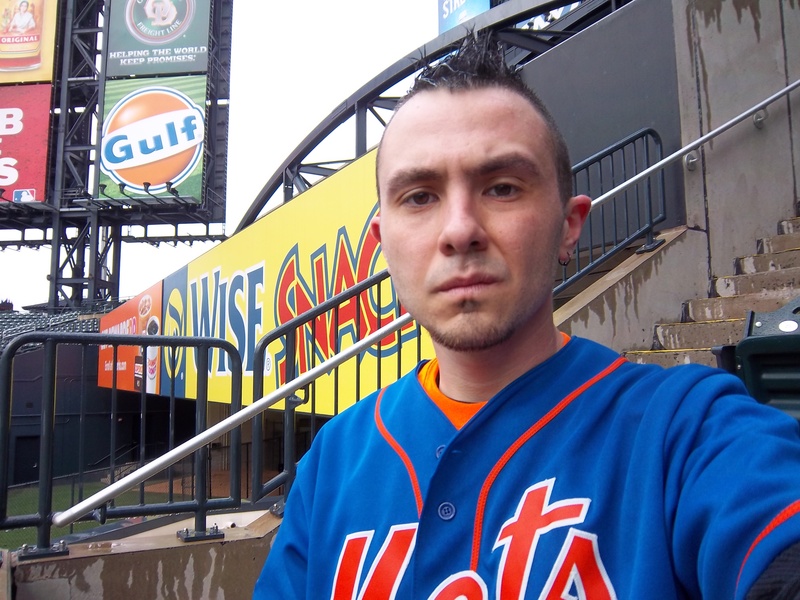 I had on my Mets gear. I signaled over to Ricky Bones who had a few balls in his hand. He was about to throw to me one when he pointed at something, and then threw it to the other kid. 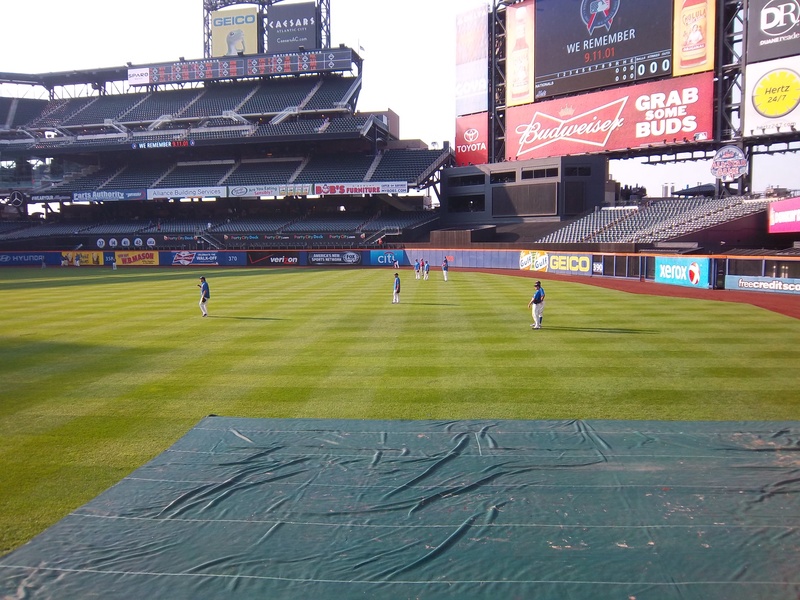 I situated myself here for the pre-game tosses by the infielders (who at this point only had one ball with them). You would think that since it was 40 degrees out you would want your arm to be warm. 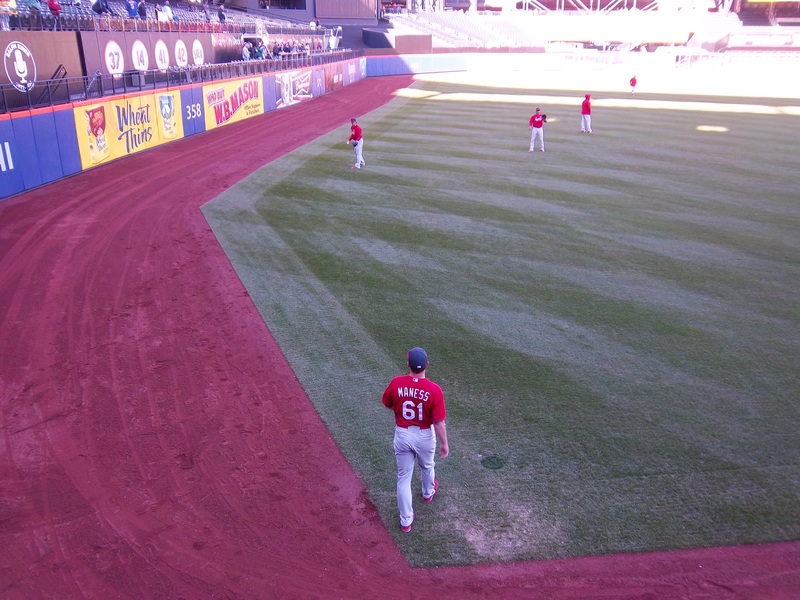 But nobody tossed at all, and Brandon Phillips tossed the ball to his right (my left) out of reach. At this point I’d have to get a gamer in order to keep my streak alive. 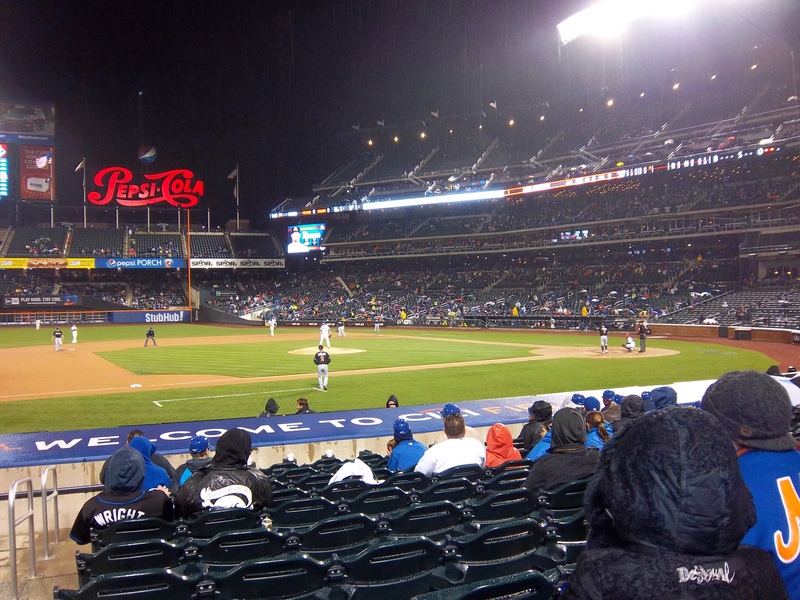 There was two innings left, so after being cold and wet, James hung out under the overhang and I hung out here chasing foul balls: I didn’t get a foul ball. I headed over to the umpires tunnel at the end of the game, and home plate ump John Tumpane handed a ball to the guy directly in front of and behind me. 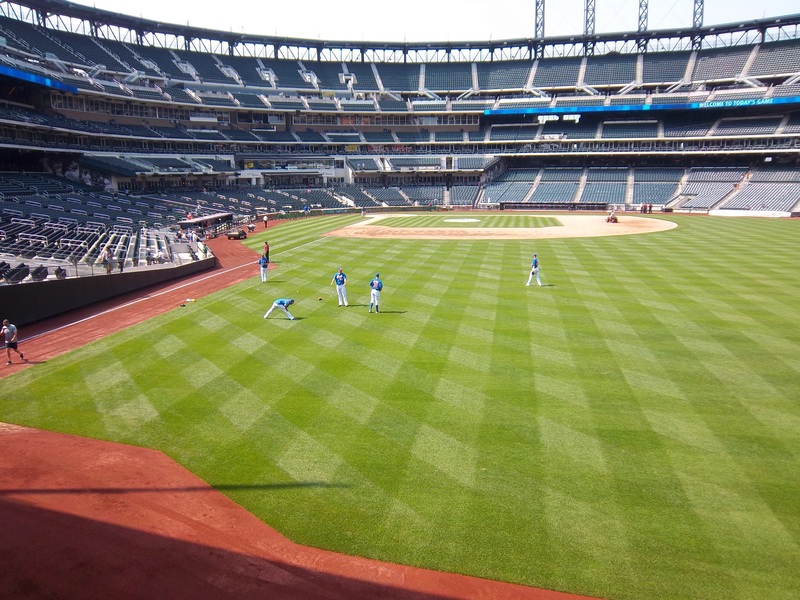 A day to forget mostly at Citi. I knew that initially when I bought these tickets, It was a 4:05 start. So there was a decent chance of BP. 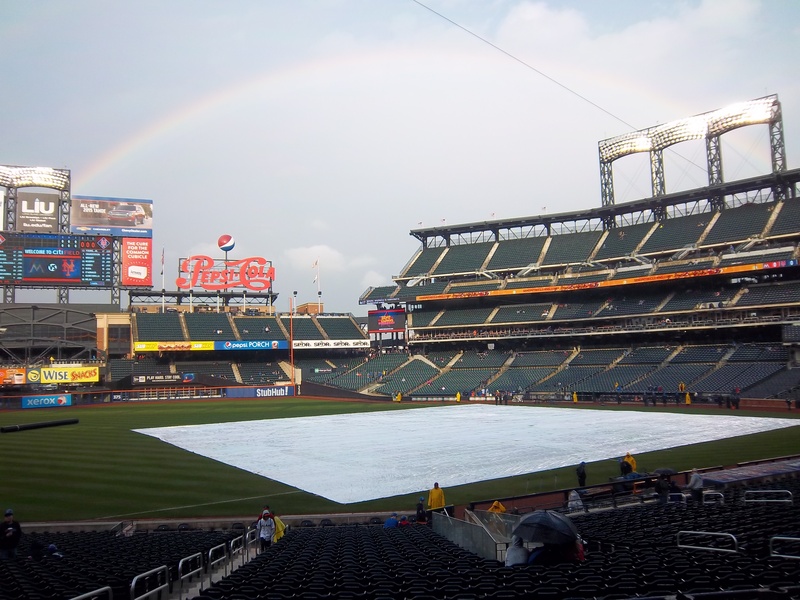 But the night before, it rained and they called for a day/night double header. This was cool because it was single admission, so I got to watch 2 games for the price of 1. But there was likely going to be no batting practice. I’d have to really try to keep my streak alive. The Marlins beat the Mets 3-0 in game 1, and the Mets won 3-1 in Game 2. This day was really fun, and I’m disappointed that I lost my pictures. Honestly, I don’t remember anything about this game. The only thing I remember was that I caught an Alex Rodriguez BP homer on the fly in what was likely one of his last games as a MLB player. Other than that, I can’t remember a thing. You’ll never believe what happened at this game, and I have zero pictures to prove it. That’s how life is, I guess. 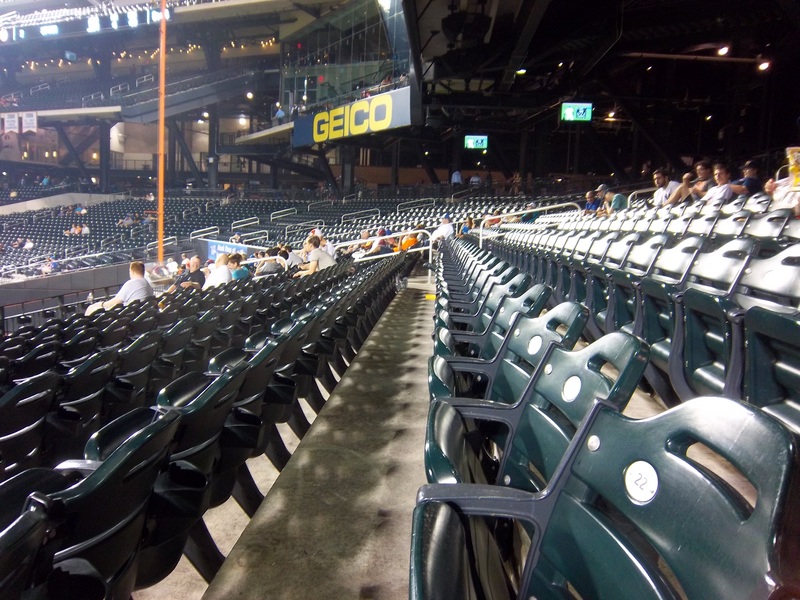 I went to this game last second because there was going to be nobody there. This game meant nothing to both teams, so I thought it’d be a good day of snagging. BP was probably the weakest I’ve ever seen, and I got 1 ball hit into the seats that I caught off a ricochet, and I got a Brewers relief pitcher to toss me a ball in right center during the Brewers’ portion of BP. 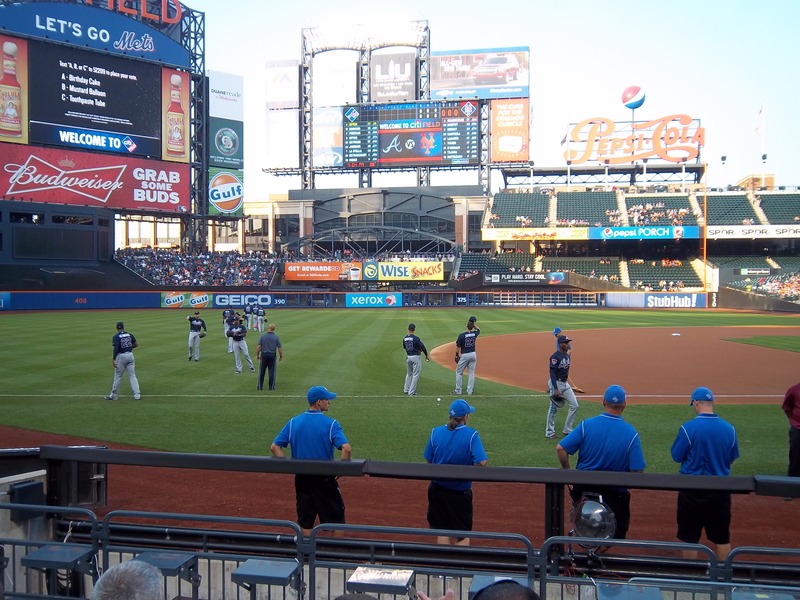 I snuck down behind the Brewers’ dugout easily, and watched the game from there. 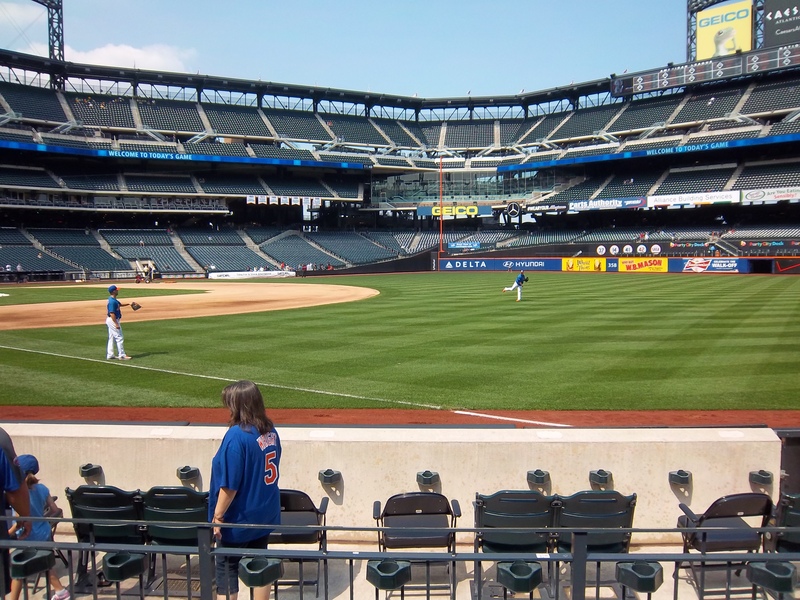 During the course of the game, this kid who was sitting by himself, no more than 13 years old was just heckling all of the Mets players. He was pretty funny too. I can’t remember how, but we got to talking. He showed me that his cousin was Yuniesky Betancourt of the Brewers. They were in town for the last road trip of the year and following the team. He was telling all sorts of crazy stories from the locker room, and told me how they felt about the Carlos Gomez incident, which was pretty cool too. I will never lose pictures again. Lesson learned. On to 2014! 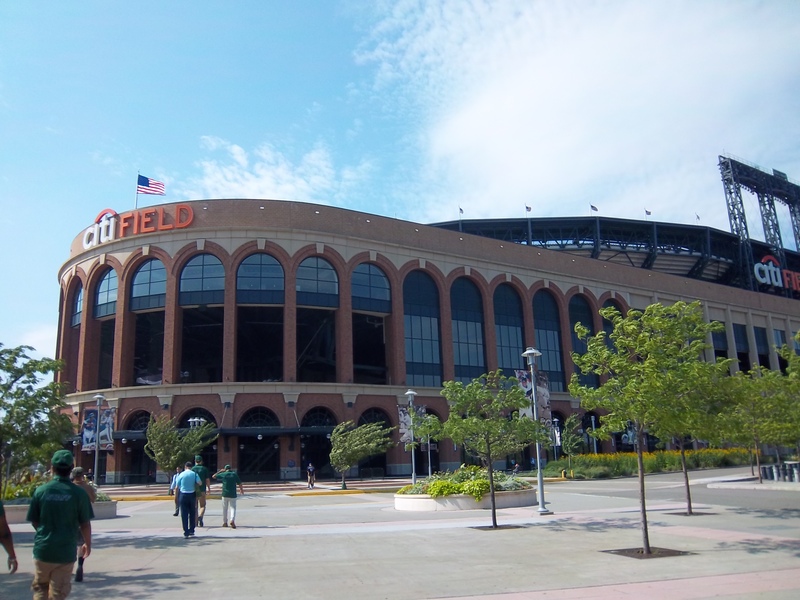 A week had passed, and I was back at Citi Field: I had bought tickets for this game before the Phillies game, as a backup in case I didn’t snag any commemoratives in Philadelphia. I saw Zack was at the gates a few minutes after me, so we did the usual hanging out before the gates opened. 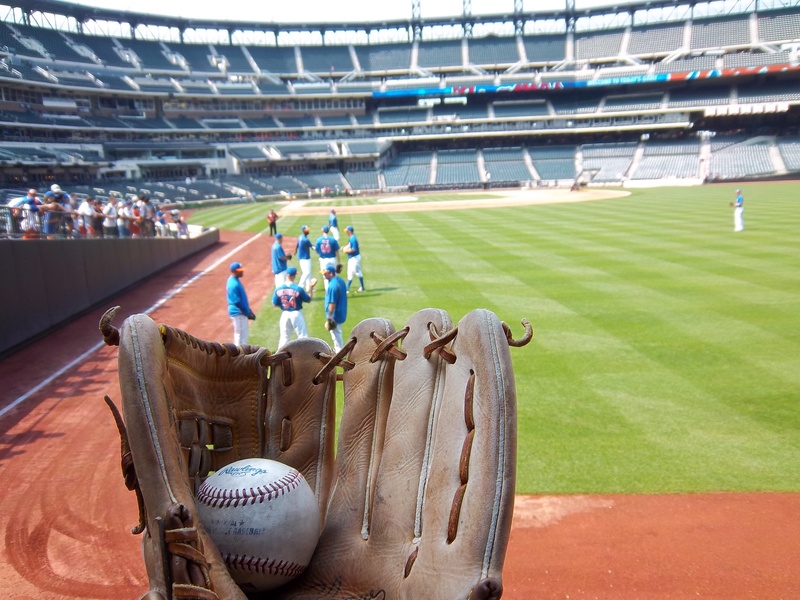 I already knew he was going to left field, so I tried my luck in right field (which was a wise choice because a group of lefties was hitting) and headed down here: …and got Tim Byrdak to toss me my first ball of the day. 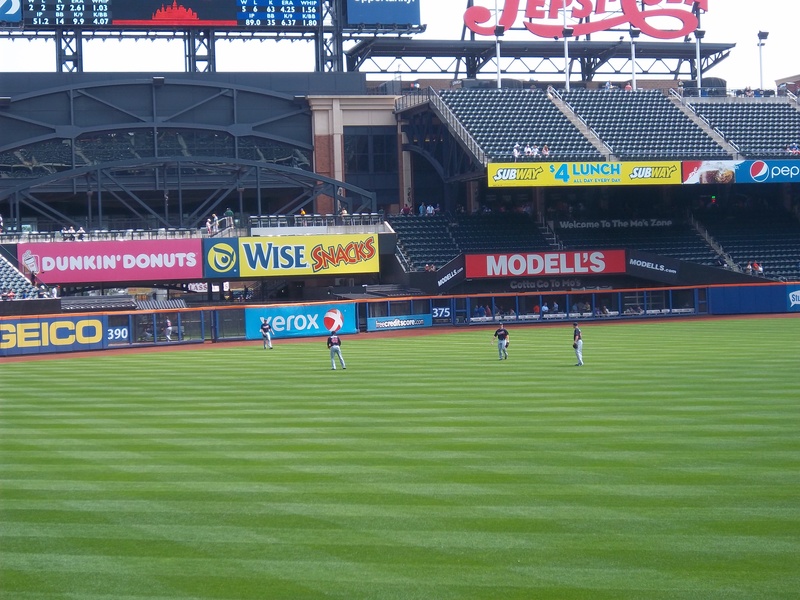 In usual Mets fashion, nobody hit any homers, so I didn’t overuse my toss up requests in right field. 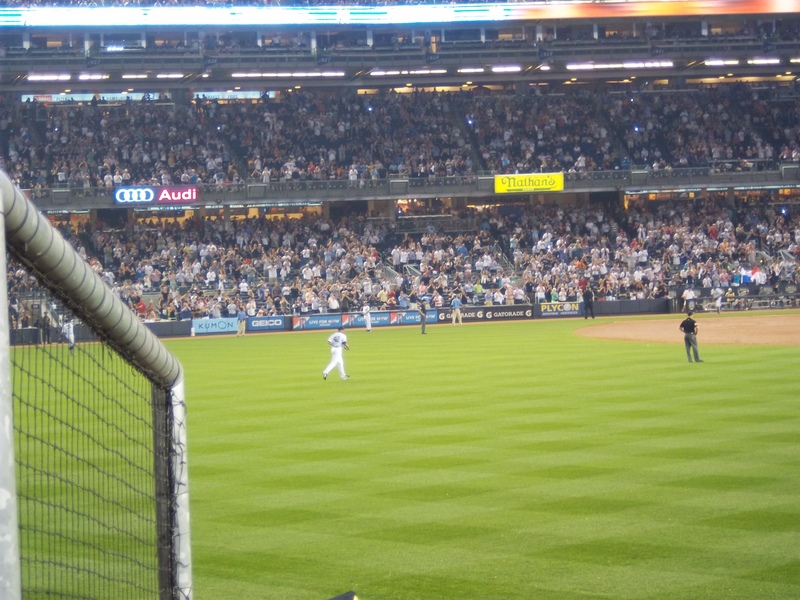 I hung out there for a little more and moved into center field and feasted my eyes on this: I was so tempted to use my cup trick to move it closer towards me, but I didn’t want to piss off the security guards. So I kept my eye on it for the time being, and focused on the field. 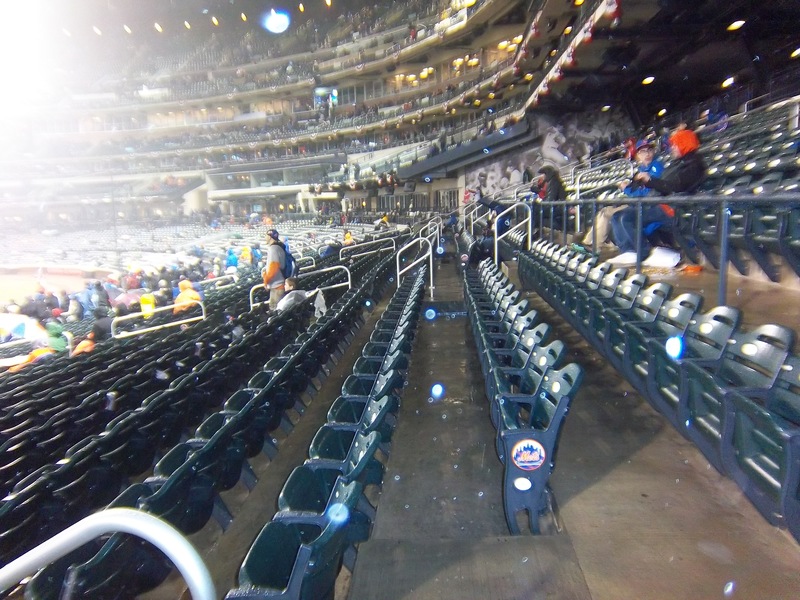 A few Mets tossed balls up into my section, but I didn’t grab one. 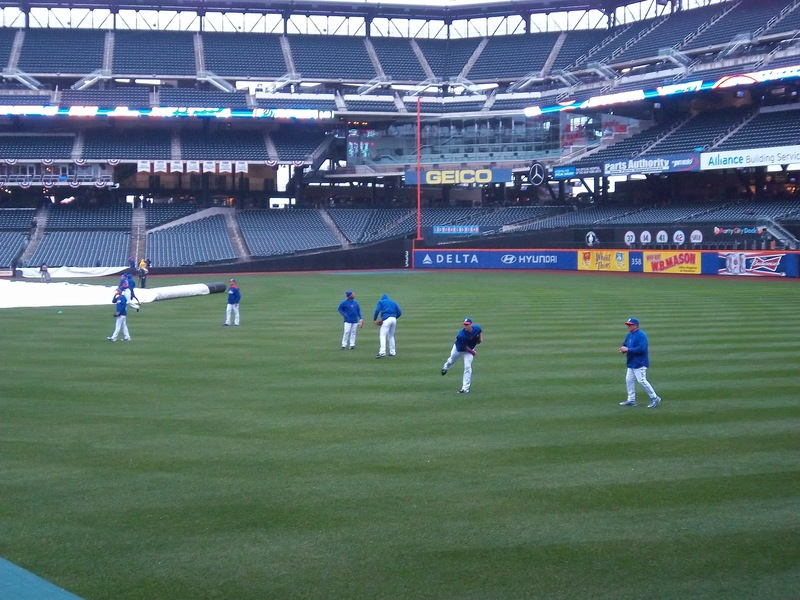 And… that was about it for Mets BP. I got a Mets groundskeeper/security guard to toss me the aforementioned ball to me for my 2nd ball of the day after the Mets jogged off. It was the moment of truth, as the Nationals came out: They do this routine where one relief pitcher runs out as if he’s going on a football route, and another relief pitcher tosses them a ball, and so on. 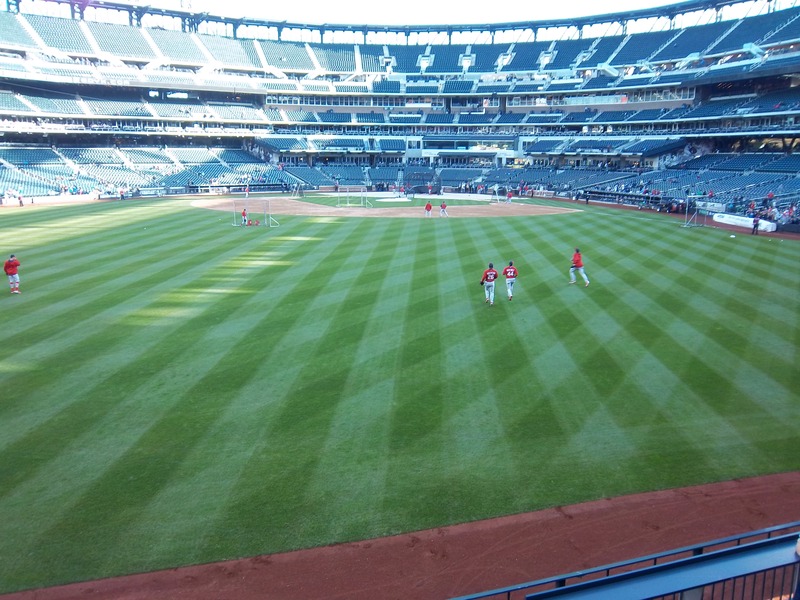 They ignored me for the most part, so I headed into the seats to try and snag some homers. For some reason, I made a ton of mistakes tonight. I misjudged two balls, and on a third, I could see Zack running towards me in my peripheral vision. So my natural instincts made me look over, and in that half second, I misjudged the homer and it tipped off my glove into the aisle. That one sucked. A couple of pitches later, I caught an Anthony Rendon homer on the fly in the 1st row in front of the Party City Deck. So I redeemed myself. 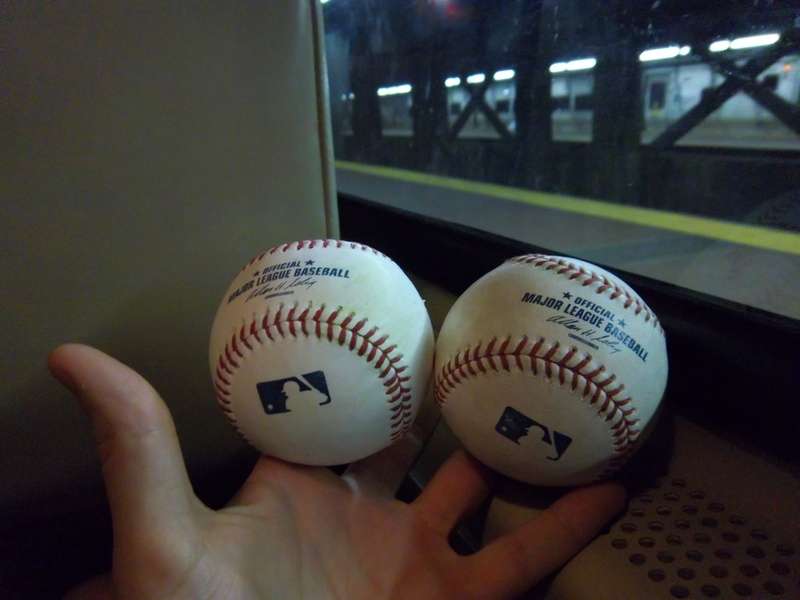 For the record, the Nationals were NOT using commemorative balls, so I was glad I decided to go last second to Philadelphia the week before. I headed over by the dugouts, where I saw Jeff Kobernus talking to someone I’m assuming he knew: I asked him if he could toss me a ball when he got the chance, and he said he would. 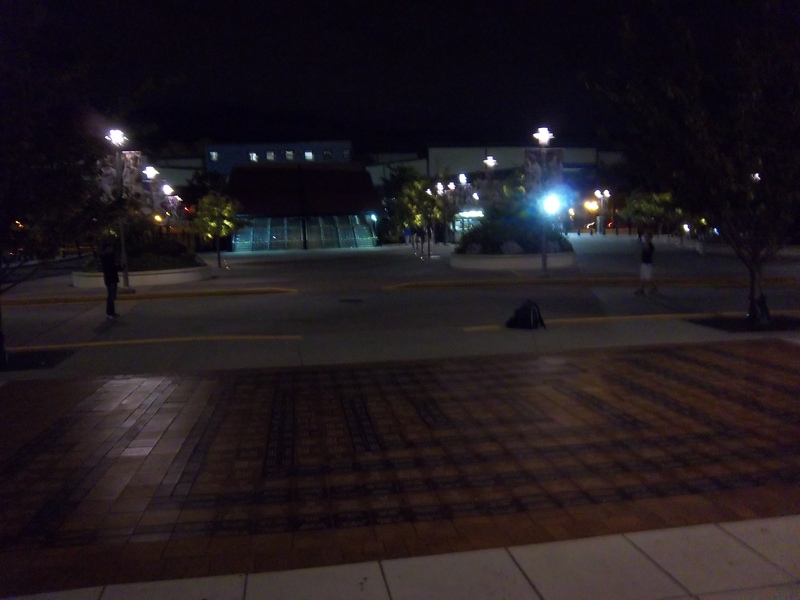 After he disappeared, I screwed around on my phone until I saw these guys come out: If you hadn’t noticed, it was 9/11. 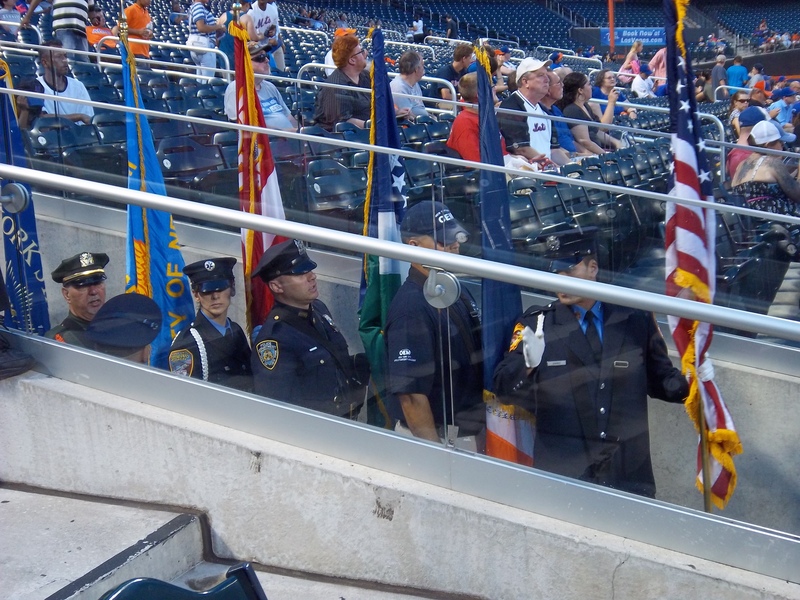 I was at the Mets game in 2012 on 9/11, coincidentally against the Nationals, and coincidentally because they were using old commemoratives. 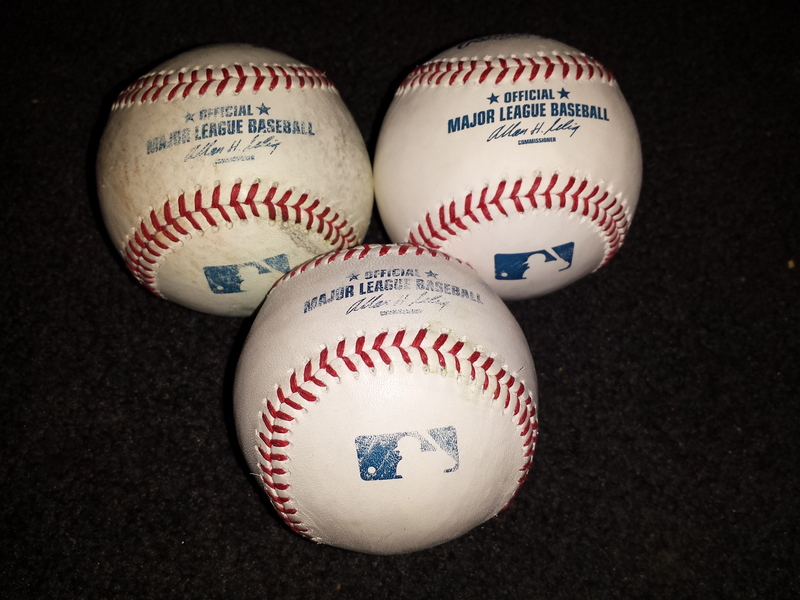 It was time to pay respects and view the ceremonies: I also failed to snag any of the pregame balls. Kobernus never came out, either (LIAR!). 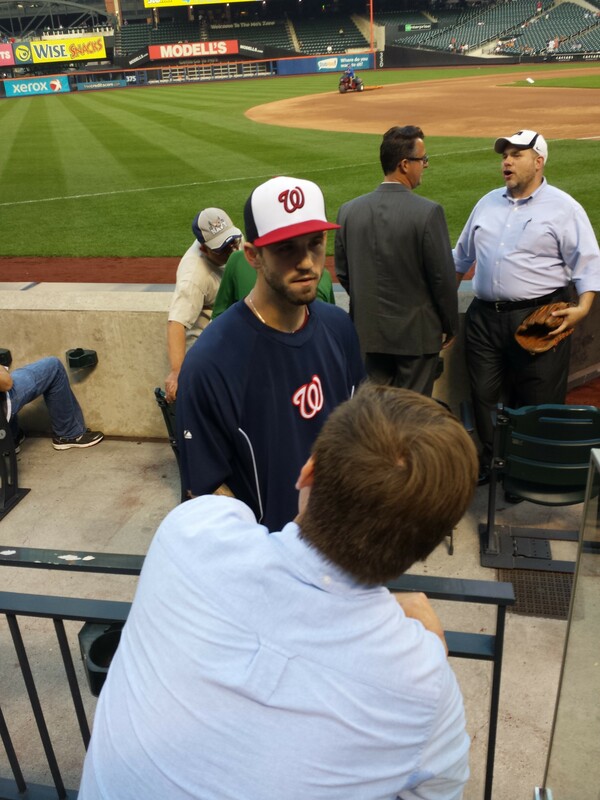 If you’re a kid (or look like one), hang back a bit and get Ian Desmond’s attention. You’ll probably get a ball. 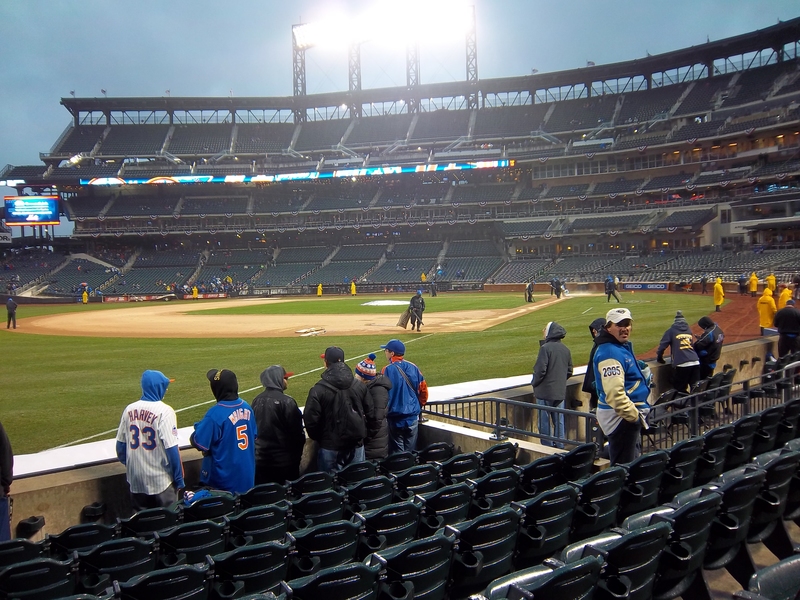 I sat out here for the game: Normally I sit by the dugouts, so why was I out here you ask? Take a look: The way the Nats were hitting this series, I couldn’t pass the opportunity up. Of course, nothing came my way, except a Ryan Zimmerman home run that landed in the party deck. 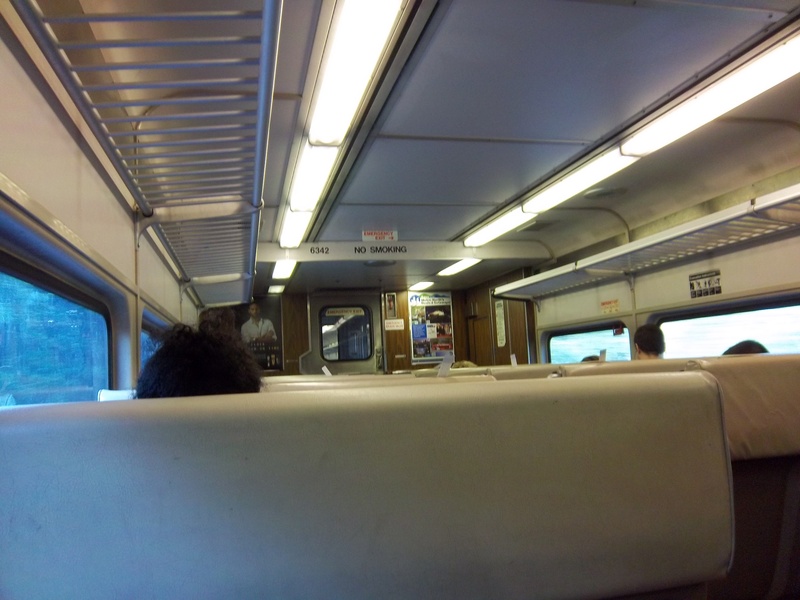 I started the day early by taking the Metro-North down to Grand Central: Normally I drive to Citi, but I wasn’t about to deal with rush hour traffic heading to the Bronx and having to pay $40 to park. I’m not exaggerating either. So mass transit it was. 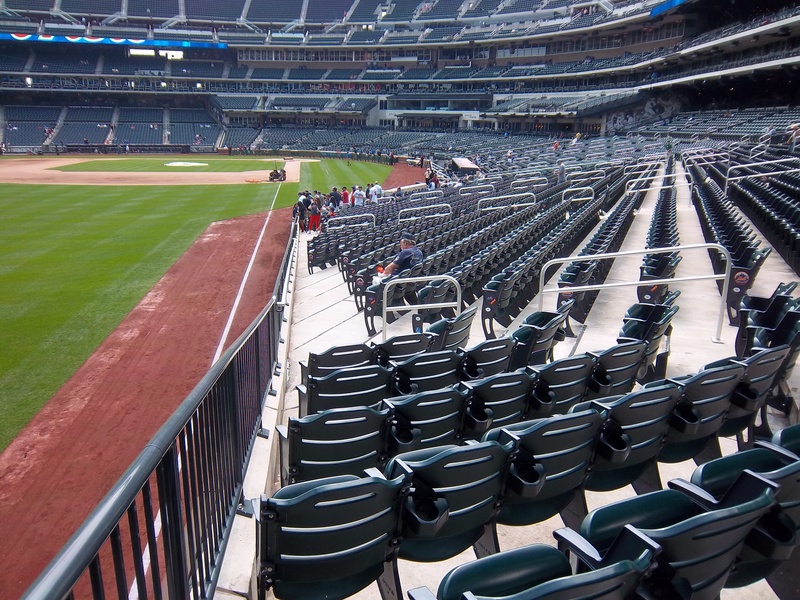 I got to Citi field around the same time as all the workers were arriving, so I was early. 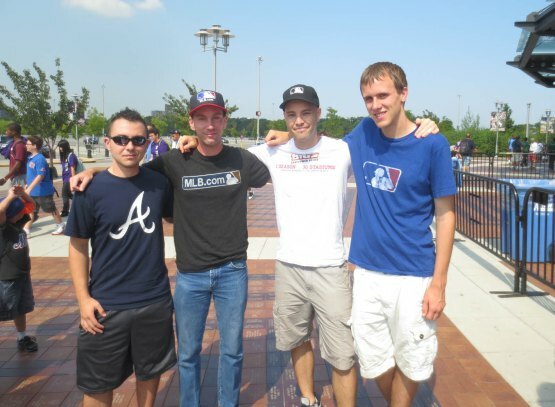 After a while, I ran into a familiar person: That’s me, Rick Gold, Zack Hample, and Garrett Meyer, a ballhawk in town from Kansas City. We just hung out in the heat for a while, and eventually, the gates opened. 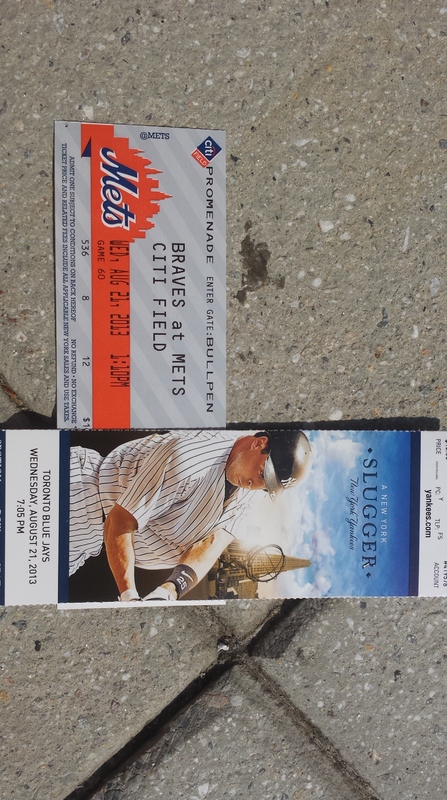 I took a picture of my tickets: I knew since it was a day after a night game, there’d be little to no chance of BP going on. 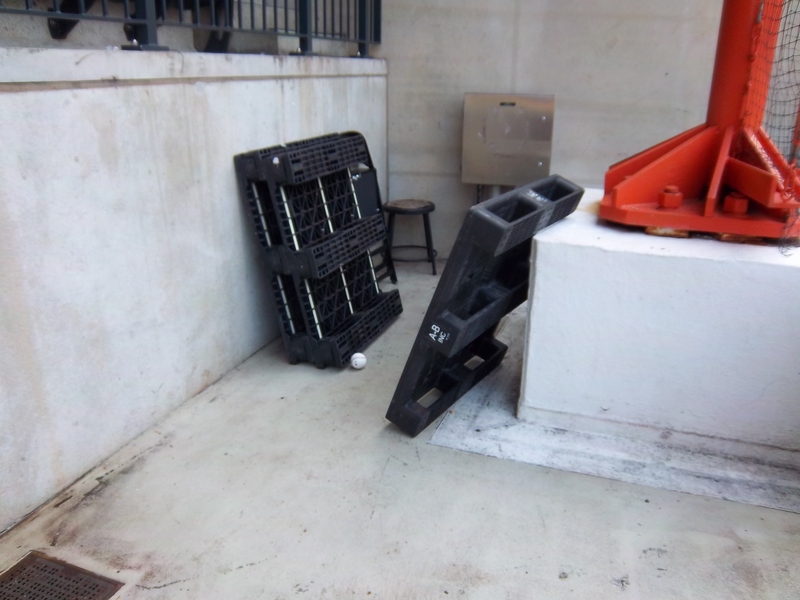 So when I ran inside, I headed over here: Just for the hell of it, I decided to look over to my left in the little alcove where the foul pole is, and I was greeted by this: …and strolled over and picked it up for ball No. 1 on the day. After a while, the Mets were done tossing, and I got Scott Rice to toss me my 2nd ball of the day: Now this snag was special. Right after I made the snag, Scott flapped his glove for me to throw it back. So I did. He pretended to put it away in his pocket, then threw it to me again. So I caught it. He then asked for the ball back, and to make a long story short, we had a catch for about 5 minutes. Now, at any other time, Zack would’ve had a ball by now. But at the moment, i had 2 and he had 0, so he was fiercely trying to snag in foul territory, especially since he had a reporter following him around. 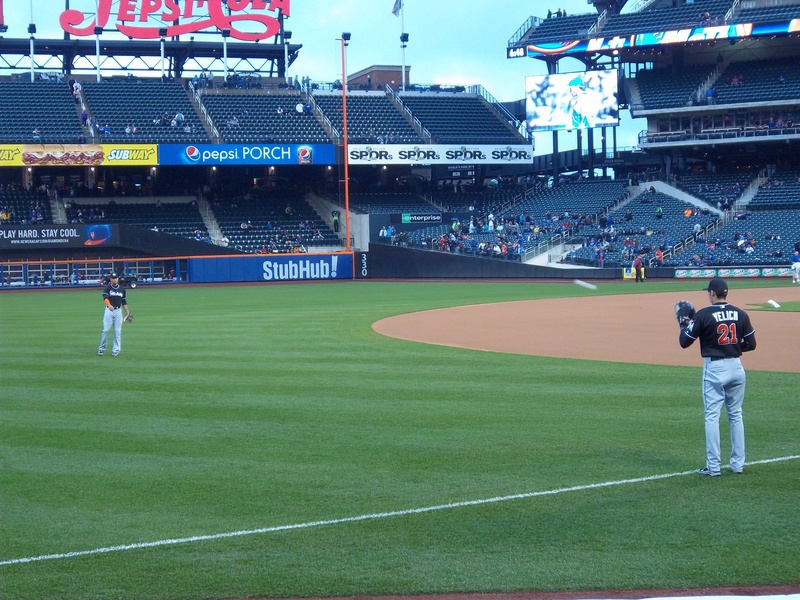 So, of course, since nobody else was in my section, I had no one to *officially* record me having a catch. 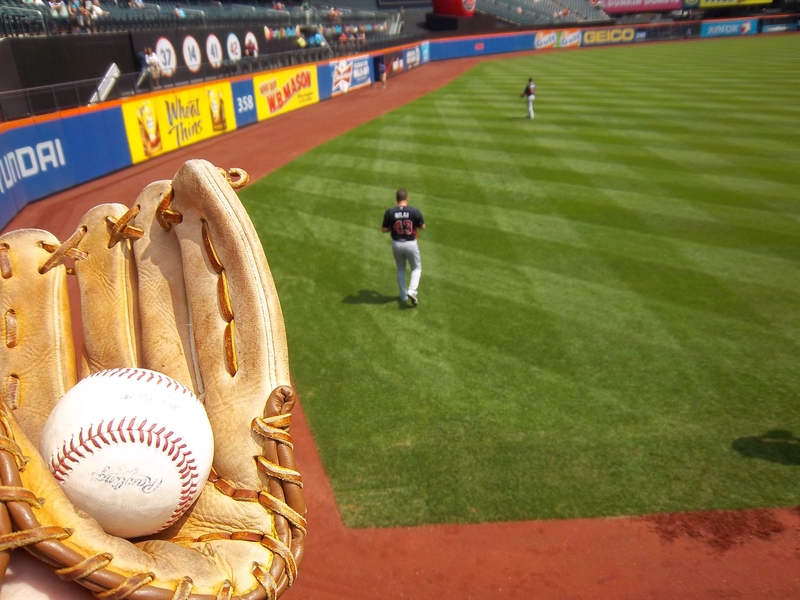 But, right after, I asked Scott to autograph the ball, and he did: Awesome. I will now be a Scott Rice fan for life. If you don’t believe that I had a catch with Rice, ask Zack, he’ll vouch for me. 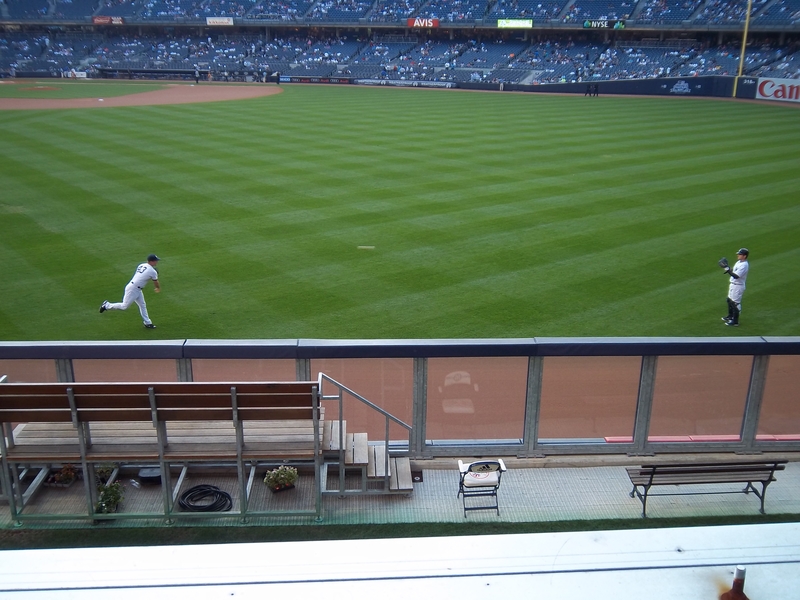 i figured I’d exhausted my resources in this area of the ballpark, so I headed over by the bullpens and came up empty. 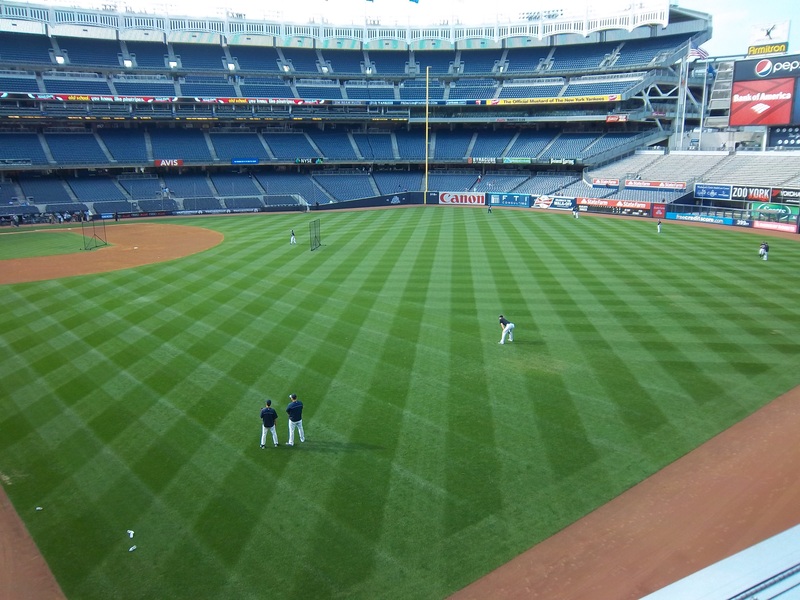 A little later, two players were tossing by the 1st base area: I came up empty there, as well. Then, the field was desolate for the next 40 minutes. 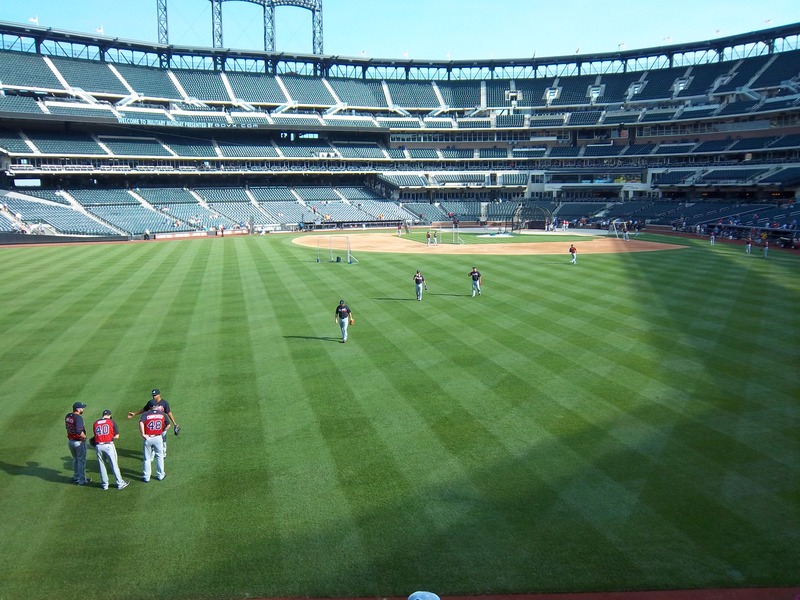 I decided to switch into my Braves gear and hung out here for a little while: Then some Braves emerged and threw out in the outfield: I decided to stay where I was instead of run over there, and I’m glad I did. 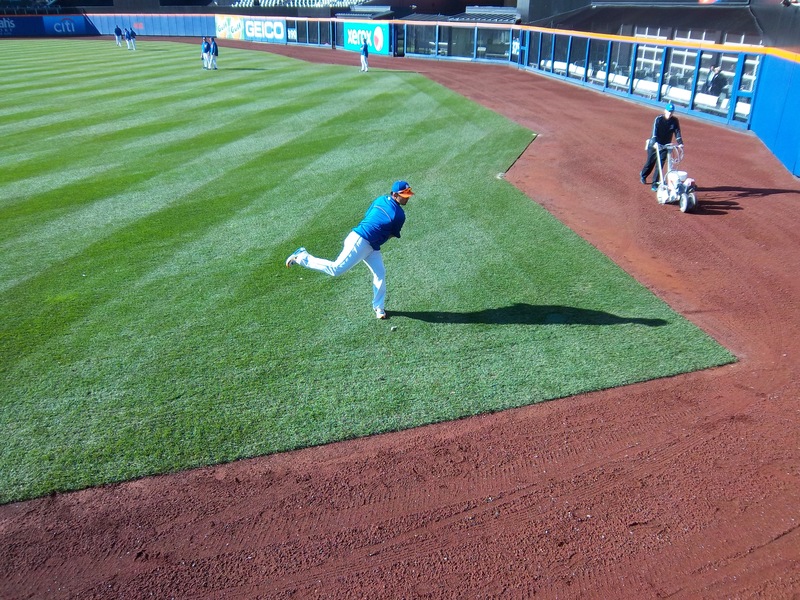 Here’s what I think happened: Zack was out in the left center field seats, because he was trying to figure out how to get a coverless ball out of the bullpen gutter. 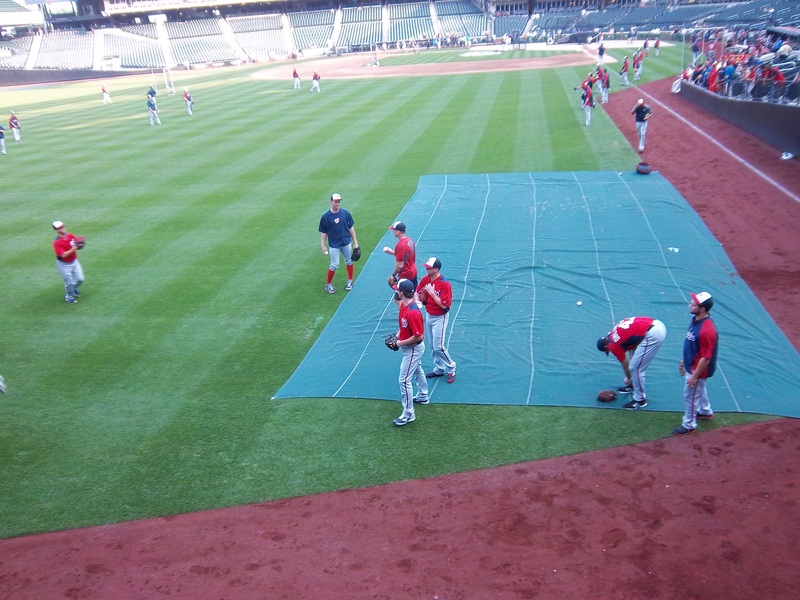 The Braves came out to toss near him, and since he’s had a bit of a history with Craig Kimbrel, I honestly think they decided to move over towards me: …so he couldn’t bother them. If so, thanks, Zack. I was waiting for David Carpenter to finish tossing with Kimbrel, when Luis Avilan came over. 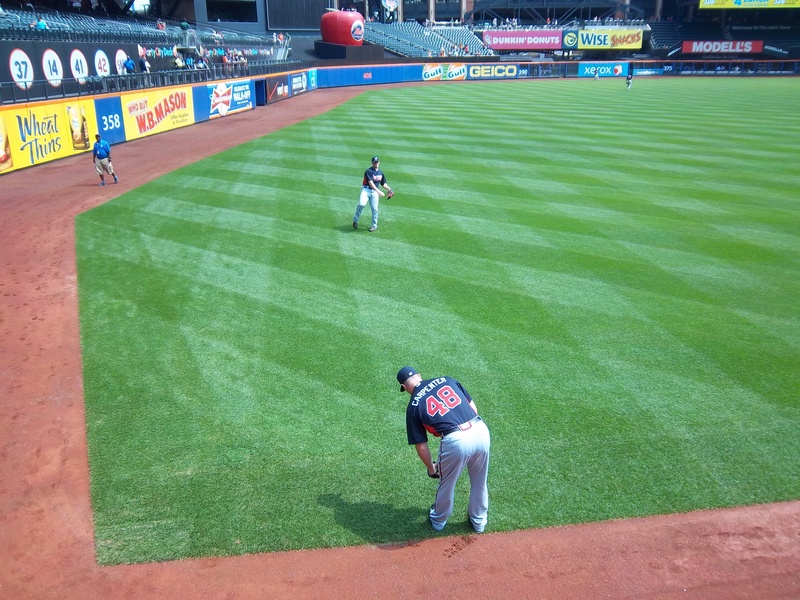 When he noticed that he was the odd man out with no throwing partner, he saw my Braves shirt and threw me – and I mean threw me – my 3rd ball of the day: (That’s Avilan in the background, #43.) 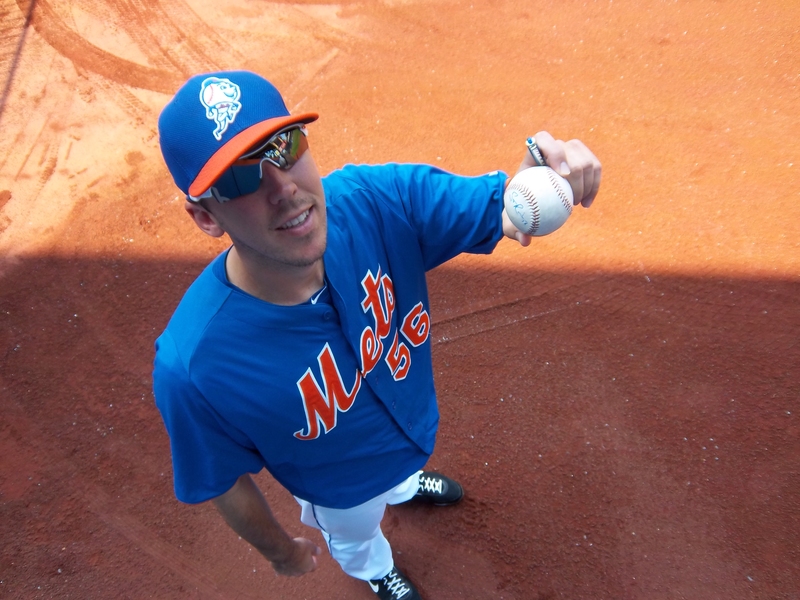 I was excited to get a ball from him, since he’s 5-0 this season with a 1.43 ERA as I write this. 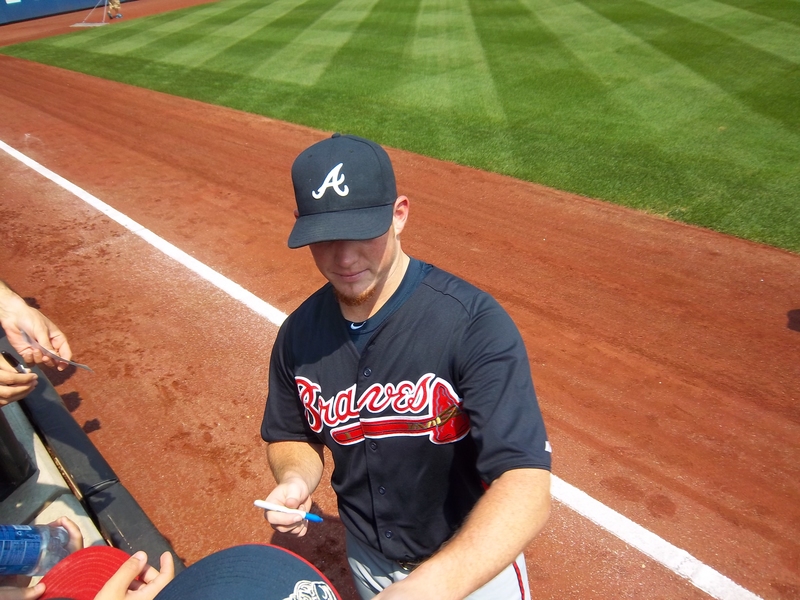 A couple of minutes later, I got Craig Kimbrel’s autograph: He was nice. As for the game, I headed to my usual pre-game spot for a toss-up: but came up empty. As for the game, I sat here: Nice. When I spoke to Zack earlier, we figured that the game would be in around the 8th inning or so when it was time to leave. At the very latest, I had to leave at 3:15 if I wanted to walk to the 7 train, take it the 45 minutes into Manhattan, and then grab the 4 up to Yankee Stadium in time to be on line at 4:30 for gate opening. And that’s exactly what happened. 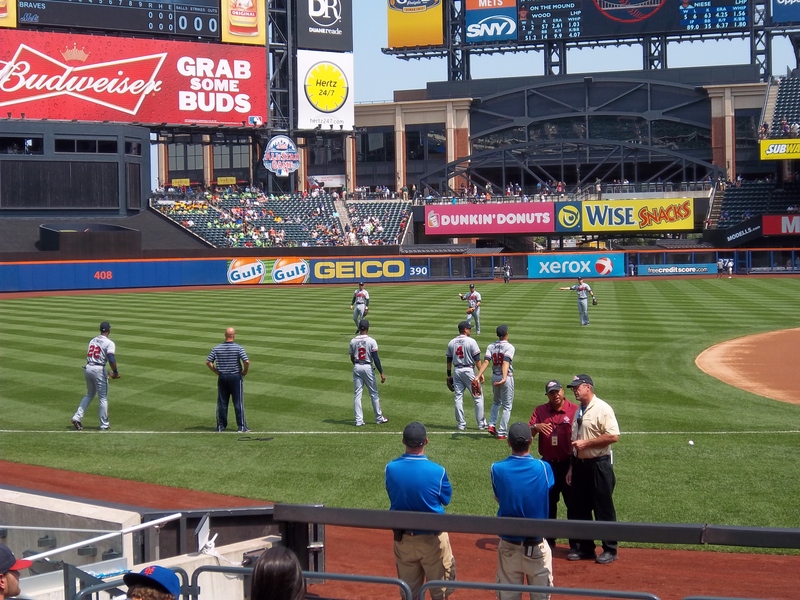 Although I forgot to mention Jason Heyward got hit in the face with a Jon Niese fastball and had to leave the game. It was a scary moment. 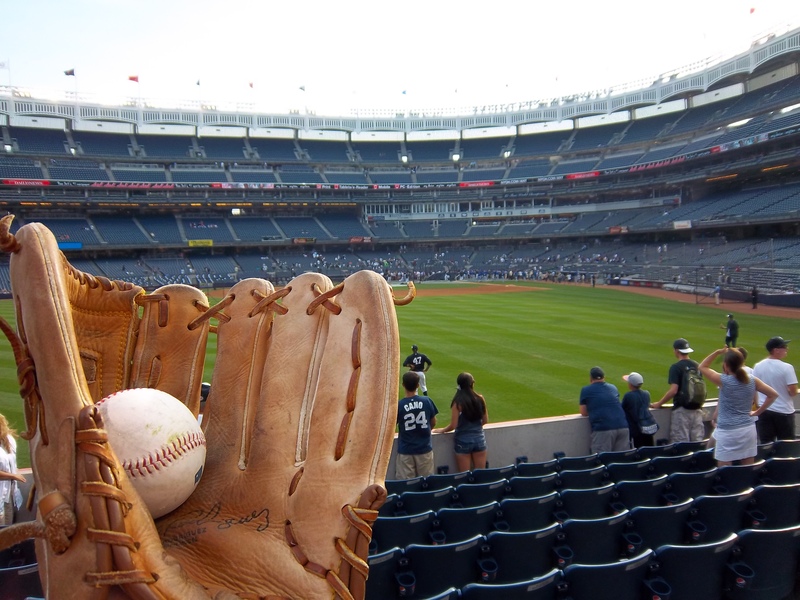 I grabbed the 4 with Zack, Rick, and the reporter, and we got in line at Yankee Stadium. I was hungry, so I went up the block to a deli for a sandwich, and grabbed one for Zack, as well (with about 15 requests). Here we all are: The guy on the left is George (I think), one of Zack’s friends, me, Zack, Andy (you remember him from my last post) and George’s son.Rick took the picture. I decided to head up to the 2nd deck in right when the gates opened, since the bottom was already crowded thanks to the same security guard who made me empty my entire bag before entering: It was severely dead. I quickly realized my mistake in going up there, and ran back downstairs to lower right. And it was crowded. And nothing got hit out. 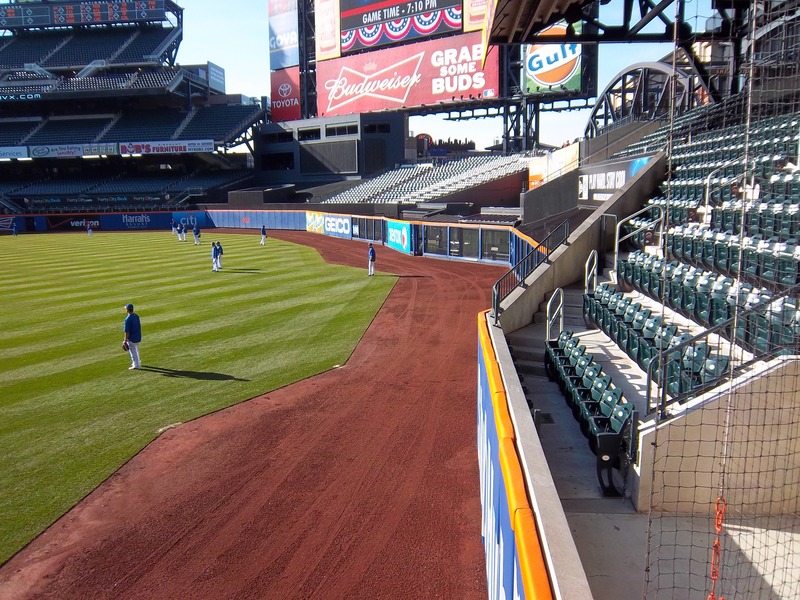 I decided to run over to left field: where it was pretty dead too. A few minutes later, Chris Stewart hit a homer into the walkway closest to the bullpen, where I ran over and grabbed it: I was relieved to snag that one. 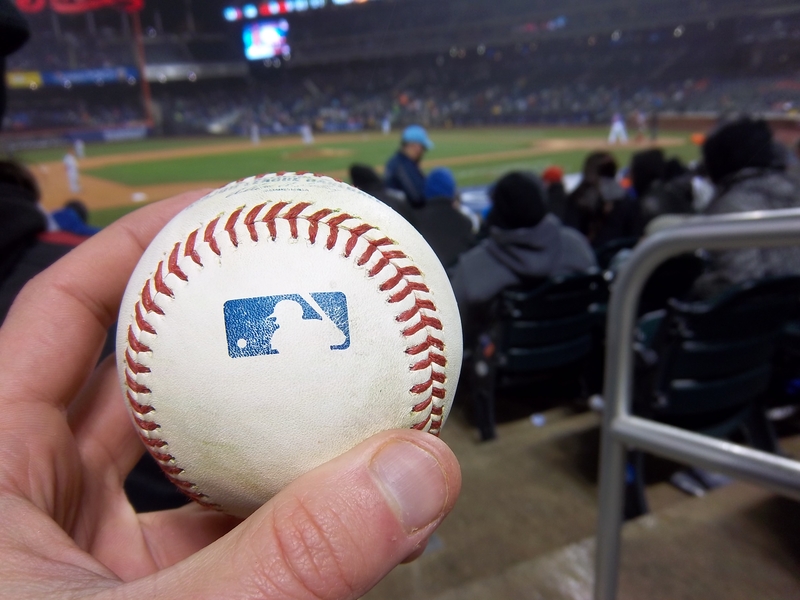 I wanted to get a ball at both games to keep my streak up, which I knew would be hard to do given the circumstances (no BP, crowded) and I was surprised that up to this point, I’d snagged more at Citi Field. 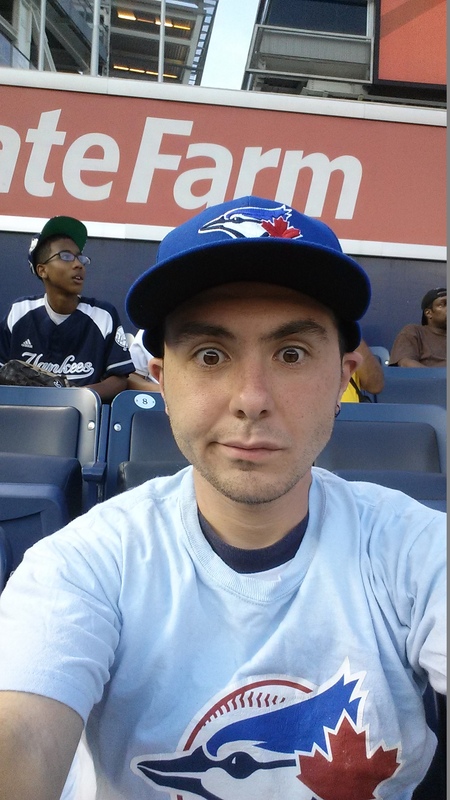 The Yanks were done and the Jays were on, and they threw nothing into the crowd. Not one ball. And they hit hardly anything out, as well which was hard to believe. Not to mention the crowds: There was no room to run. I was getting frustrated, and nothing was getting hit out. I remembered why I hated coming here. I couldn’t believe it!